Indiana University East’s Hispanic Heritage Month celebration includes several events and activities offered by the World Languages and Cultures department and the School of Humanities and Social Sciences. The annual Day of the Dead Altar Building Competition will be held on October 2. Spanish classes at IU East create the altars and speak about the Day of the Dead. IU East students are visiting schools across Richmond for Huevos verdes y jamón (Bilingual Storytelling). This is a joint venture with the Campus Library and literacy movements. The library has purchased books and packets for IU East students to read with local elementary-aged Hispanic English learner populations. The program is in its sixth year. IU East students read books to students at Elizabeth Starr Elementary and spoke about Hispanic Heritage Month. IU East Spanish learners read their books to the classrooms and spoke about Hispanic Heritage Month. The elementary Spanish speakers taught IU East Spanish students pronunciation and other language skills. On September 14, IU East Spanish students and faculty Dianne Moneypenny and Christine Nemcik, assistant professors of World Languages and Cultures, directed Spanish Bingo with third-grade students from Randolph County. The third-graders visited the campus for the “Walk Into My Future” kickoff event for the Randolph County Promise. 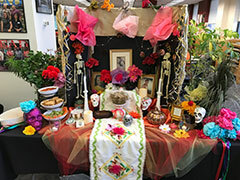 On October 2, the Day of the Dead Altar Building Competition will be held at 2 p.m. in the Campus Library in Hayes Hall. Both online and on-campus Spanish classes at IU East will create altars for Day of the Dead. Members of the campus will be invited to contribute photos of loved ones as well. The classes will present their altars and speak about Day of the Dead via the Hispanicampus gallery project. The campus and community will electronically vote for their favorite altar. Hispanicampus Virtual Galleries for all Hispanic Heritage Month activities will be available throughout the month at flickr.com/photos. Guest speaker Jorge Echevarría, certified tour guide and entrepreneur from Puerto Rico, will visit campus October 8-9. He will give various talks about Puerto Rican travel, wildlife, and culture, including suffering through Hurricane María and the recovery process. He will speak with students in Spanish, business, and biology courses, give an Honors Program dessert program, present at the annual Faculty Staff Diversity Luncheon, and record an interview.